Deputy director Wu Shulin (邬书林) of the General Administration of Press and Publications has been in the news a lot recently. Allegedly, he had made a public statement to publishers on January 11 in which he referred to eight books as being 'banned.' Among these looks is The Other Stories of History: My Days at the Supplement Division of the People's Daily (风云侧记——我在人民日报副刊的岁月) by Yuan Ying (袁鹰). (see Qian Gang's book review in The Other Stories of History). 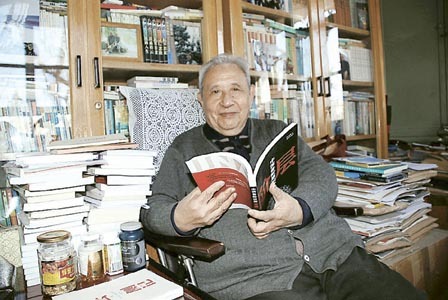 Now Yuan Ying happens to be a Communist Party member for more than 60 years and he took exception that anything in his book might be construed as "leaking state secrets." The following is a translation of his own notes about a meeting with Wu Shulin. How are you! I'm a retired cadre at the People's Daily (former director of the Literature Department at the newspaper) and an honorary committee member of the Chinese Writers Association's National Committee. I am the author of The Other Stories of History: My Days at the Supplement Division of the People's Daily (published by the Chinese Archive Publishers in October 2006). I recently learned that deputy director Wu Shulin announced a list of "selected books that violated publication regulations in 2006" at an "informational meeting" at the National Books Order Conference on January 11. Eight books were named, including mine. According to reports, Deputy Director Wu characterized the crime of my book as "leaking state secrets." When I heard that, I was very shocked. I have no idea which essay in this book leaked any "state secrets." I have been a Party member for sixty years. I worked at the Party newspaper for a long, long time. Therefore I understand the nature and weight of the words "leaking state secrets." In my work, I was extremely cautious and I have never committed the mistake of leaking any secrets. This book was based upon my recollection of what I personally experienced and observed during my more than 30 years at the People's Daily. Everything in there is true. Most of the essays were previously published in People's Daily, Liberation Daily, News Publishing News, Yanhuang Chunqiu, Zongheng and other publications, and there had never been any problems about leaking secrets. Since this matter affects my personal reputation as well as pertains to the protection of the constitutionally guaranteed rights for citizens to speak and publish, I ask that you explain in a clear and responsible manner. After I heard the news, I waited for a formal notice from the General Administration of Press and Publications. It has been almost 20 days, and neither GAPP nor deputy director Wu has deemed to send me a single word. I have heard that there is a huge Internet talk storm over this (I do not get on the Internet; I only heard this from friends). I don't understand that if deputy director Wu thinks that there is a problem with this book, then why not make a serious effort to understand and ask the author and the publisher to obtain their opinions? Instead, it was just abruptly announced a meeting with the leaders of various publishing houses without any notice served to the authors afterwards. This sort of crude approach violates the rights of the authors. I must express my discontent and protest. I have been patiently waiting for quite a while. I look forward to a response that addresses my concerns. On the morning of January 30, the People's Daily Literature Department director Guo Yunde called me to say that Mr. Wu Shulin had just called him to say that he had just received my letter and wanted to speak to me in person to explain the situation to me. I told Yunde over the telephone to tell Mr. Wu not to bother to come over as a letter from him would be enough. Ten minutes later, Comrade Yunde called again to say that deputy director Wu insisted on seeing me. Wu had informed GAPP director Long Xinmin, who instructed him to come over and provide an explanation as quickly as possible. We made an appointment at my home at 10am, January 31. At 10am, January 31, Deputy Director Wu came in the company of his secretary and Comrade Guo Yunde. I and my wife Wu Yuhong (retired cadre from the League Central) received them. We spoke for about one hour . The following are the main contents of the conversation (when our guests left, the two of us wrote this down based upon our recollections). Wu: I'm very sorry that this affair has caused Teacher Yuan so much trouble. I feel terrible. When I received your letter yesterday morning, I immediately informed Director Long and I said that I wanted to personally see Teacher Yuan to explain. Director Long said, 'You ought to do it as quickly as possible.' I wanted to come over yesterday afternoon, but Yunde was busy. Therefore, I had to come over today no matter what. There are many rumors outside and the hearsay is inaccurate. First of all, I want to tell you that at the January 11 meeting, I was mainly talking about certain problems with the publishing houses violating publishing regulations. There was nothing about authors, and no name of any author was mentioned. I did not speak of banning any books. Wu: I absolutely never said that your book leaked "state secrets." Today, I specifically brought the original copy of the speech that I gave at the meeting. (He took out a document from his briefcase and flipped to a particular section). Please see whether it mentions "leaking secrets." Concerning the matter of the Chinese Archive Publishers' failure to follow the procedures concerning major topics in publishing The Other Stories of History: My Days at the Supplement Division of the People's Daily, the outcome was as follows: The Chinese Archive Publishers did not have approval but went ahead to publish The Other Stories of History: My Days at the Supplement Division of the People's Daily in October 2006. This book records the people and events that the author encountered at the People's Daily Supplement Division, including certain contents about the anti-Rightist campaign, the "Cultural Revolution" and certain Party and state leaders. Since this book did not follow the procedure for filing with respect to major topics, the publisher was issued a warning notice and will not receive an increase in book titles for year 2007. Wu: People are now talking about eight books, but there were actually only five. During internal discussions, there were eight books mentioned in the materials that were sent over. Your book was among the five books. Yuan: That is strange. Although your document did not have the words "leaking state secrets," the raging talk outside is widespread. When my friends called me, they all said that they read on the Internet that the book was in trouble for "leaking state secrets." Where did they get the information? Could it all be made up? Mrs. Yuan: The two of us have been Party members for sixty years . We have never committed any mistake involving "leaking secrets." Wu: I really did not say that your book "leaked state secrets." I have no idea why they are saying that on the Internet. There is plenty of fabricated and inaccurate stuff on the Internet. For example, I read the statement from Zhang Yihe at the first instant. She quoted me incompletely and inaccurately. (He flipped to the relevant section in his document and read a section. He read it very quickly, and I could not remember it). So it becomes more distorted as it gets passed along. I solemnly inform Teacher Yuan: This matter had been completely directed against the publishers for not following regulations; it was not directed against authors. You just read it -- I did not mention your name. Yuan: Have you read my book? Wu: Frankly, I have not read it. Someone else read it and told us. We only have just over 20 workers, we have many duties and we don't have time to read. So we ask the comrades in other departments to read the books. Mrs. Yuan: Although this is directed against the publishers, it must actually affect the authors. The impact is very huge now. Yuan: It is impossible not to have a serious impact on the authors. For the last several days, I have received many telephone calls. My friends told me that there were criticisms on the Internet every day about what you did. They printed some of the material for me to read. Wu: I've read many essays on the Internet. They are all coming after me. I am the first person in the path of the storm. Who can I complain to? I'm carrying out the decisions of the GAPP. In the last several years, the central government has issued certain strict regulations about publishing. In my position, I have to enforce those regulations rigorously. It is not a personal thing. Right now, it is a common thing for the publishers to break the regulations. We have heard a lot of feedback from people. The book <Cang Seng> referred to opium-growing during the Yenan era and certain old comrades at the Beijing military district retirement home were infuriated and wrote us to complain. <I Oppose> was about a county People's Congress representative and it had a broad impact. People's Congress standing committee member Wang Zhaoguo and deputy commissar Sheng Huaren both called us to account. There are many similar problems. We had to pick a few national publishers to warn them. The books that were mentioned this time all involved contents such as the anti-Rightist campaign, the Cultural Revolution, and Party and government leaders, and therefore they should have gone through the process of filing for approval. Yuan: These are your internal regulations. The authors are not aware of them. I have never seen them before. The areas covered by these regulations are too broad. Many books will involve these kinds of content. Must they all be screened beforehand? Wu: These are the requiremenst from above. Two old comrades have asked me about what kinds of problems can occur. I told them: for example, the facts are in error, secrets were leaked, the published speeches diverged from the actual ones, etc. Books with these kinds of contents should be filed and submitted to the relevant organizations to review. These regulations should be followed. Yuan: The reactions of society as well as the Internet commentary do not care which publisher violated which regulation. They are worried that your actions damage the reputations and rights of the authors. I received many telephone calls. They were all asking about the book and they didn't care about the publisher. Wu: This matter has created a lot of trouble for you. But we must carry this out. I hope that you understand. Yuan: You named eight books this time. This is not just about me personally, because it has created a very bad impact with the readers and authors. I saw the Internet commentaries forwarded by my friends, and they are all criticizing the banning action as illegal. Some people said that Secretary General Hu Jintao is emphasizing the democratic rule of law and the construction of a harmonious society while Premier Wen Jiabao recently went to the meeting of writers' representatives to ask the writers and artists to speak the truth. Aren't your actions deliberately opposing them? The bad influence has already occurred. I think that you need to take remedial action as quickly as possible in order to reverse the influence. I recommend that you publish the document that you just showed me either at a press conference or on the Internet for everybody to see. Wu: I also thought about doing this. A few days ago, I reported to the Information Office of the State Council as well as to the Central Publicity Department. I proposed a way to explain the truth. There is so much commentary on the Internet, and we ought to explain the case clearly to society. I also said that if I had to made the explanation myself, I am prepared to do so. To tell a joke, "If I don't go into hell, the who else will?" The report was sent up a few days ago, but it has not been approved yet. I'm also feeling very anxious. Mrs. Yuan: The Internet reactions have been very strong. What you did has seriously affected the images of the Party and the government. The two of us are Party members for over six years, and we even felt that what you did was bad. Yuan: On the day before yesterday, I received telephone calls from students in the United States and Canada. They even knew about this affair over there. Overseas media are also reporting on it. They were shocked that there could still be book banning nowadays. You need to work hard to reverse the impact. We are going to have the two Congresses soon with plenty of foreign, Hong Kong and Taiwan reporters coming here. This affair can become a hot point and those reporters will be coming to you. If you don't do anything, you will be even more defensive. Mrs. Wu: The solution should be provided by the one who caused the problem. You must explain the situation to the outside. Otherwise, the impact is too huge. Society is not happy either. Wu: We did not ban any books. At the time, I told the publishers very clearly. "We did not ban any books. Rather, you people have violated the regulations." Some publishers admitted that they did not follow the procedure to file and obtain approval. As for your book, I spoke to the leaders at the Chinese Archive Publishers. They will need to make up for the filing. If they want to do another printing, it should be possible. Yuan: Can you consider revising those "regulations" of yours? The scope is so broad and the restrictions are so tight. This is not good either for writing or publishing. Wu: Yes, yes. But we can only implement them right now. (Rose up to leave). If Teacher Yuan has anything else for us to do, please say so anytime. Yuan: Thanks. I don't have anything personally. I only hope that you people can take care of this matter properly and the sooner the better!